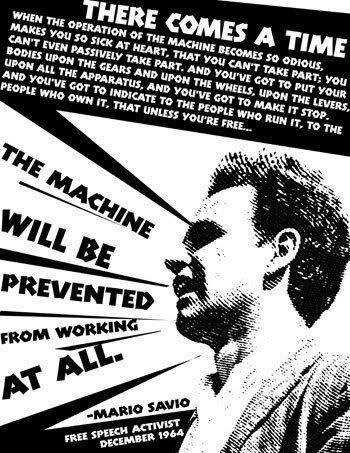 These are the words of Mario Savio, a leader of the Free Speech Movement at the University of California – Berkeley, from a speech he gave in December, 1964. I’ve thought about this speech – you can read all of it here – and how it relates to the protests happening today thru Occupy Wall Street and Occupy Together. Listening to the people who are there in New York, you here a lot of the same themes. (Citizen Radio had a great feature with lots of interviews on their 10/3 podcast – note the hosts do use profanity) The young people there felt powerless and that they had become commodities. However, when they are with their comrades in Freedom Plaza or on the street, they feel part of a community and empowered. On the Mario Savio website, there is a list of Memorial Lectures. The next one will be in November and will feature former Labor Secretary Robert Reich – on the subject of Class Warfare in America. Previous speakers included Elizabeth Warren, Naomi Klein, Robert F. Kennedy, Jr, Angela Davis, Seymour Hirsch, Any Goodman and Molly Ivins. Check it out.